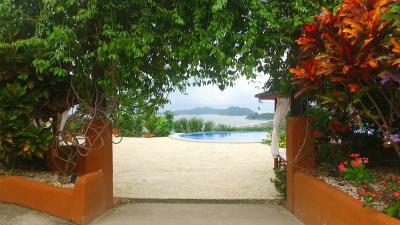 Lock in a great price for Eco Boutique Hotel Vista Las Islas Reserva Natural – rated 9 by recent guests! Incredible views of the bay! Very friendly and helpful staff. Would come back in the future. The view was magnificent. The staff was very friendly and helpful. The breakfast was good. 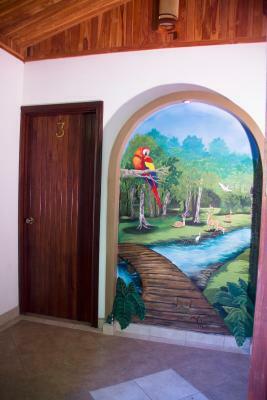 They offer adjoining rooms with an outside door. Each room had a door that locked and outside the door was an entry area and then another locking door. This was great for safety concerns when travelling with a family. They also had a guard at the gated entrance. The pool was very pretty and there was a pool table and other outside games. Great for a couple or a family. It was a little funky with no shampoo and some other quirky things, but overall it was great. Beatiful boutique hotel! 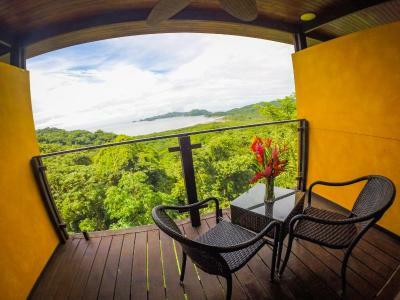 Room has all you need: fridge, tv, ac, balcony with an espectacular view to Pacific Ocean and natural reserve, so you can observe monkeys, Coatis and Iguanas. Staff is friendly and always is willing to help you. 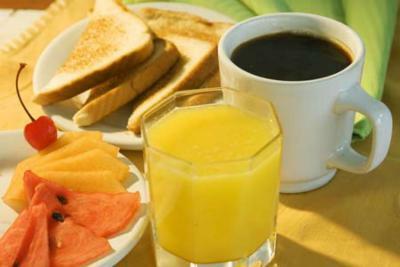 Restaurant offers good dishes and breakfast is complete. Surely, we will come back! 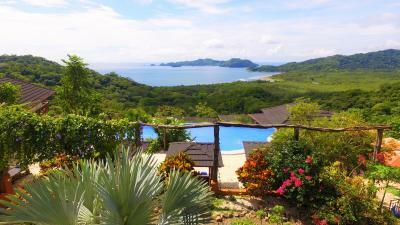 Here you will experience PURA VIDA!! 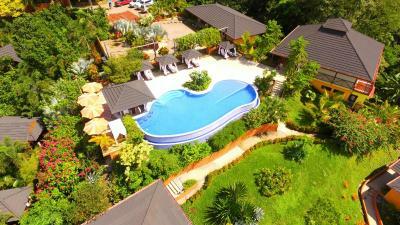 Beautiful view by the pool and large breakfast included with the room. Great place to stay before taking the ferry as it is just a 10 minute drive away. The staff was extremely friendly and helpful. the view from the rooms and the pool was incredible! 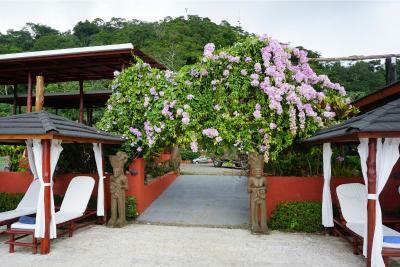 our room and the spacious bathroom were very comfortable, and we loved hearing the howler monkeys at night. we ended up spending an entire day between the pool and the cabana as a rest day on our two-week honeymoon, and felt truly relaxed throughout the day. we enjoyed meeting the other young couples staying there, as well. The views are outstanding, and from our room it was also spectacular. The restaurant had great food and drinks. 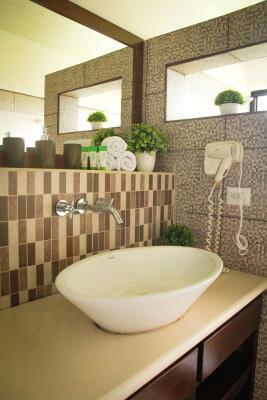 The beds and air conditioning in the room were perfect at night, and the shower was hot and had great pressure. This place is for all - families couples or solo - but it was super romantic so I would recommend it for a great couples getaway. That being said we saw lots of other families and enjoyed the foosball table and pool a lot. 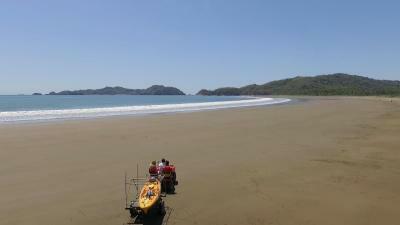 We ventured down to playas oraganas and it was one of the best beaches we have seen in Costa Rica. 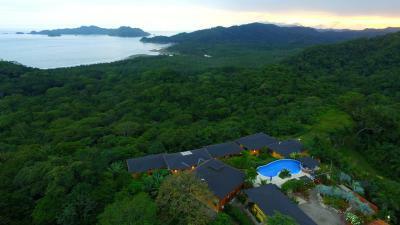 This is a beautiful hotel on the top of a hill looking down over the jungle and ocean. Everyone gets their own little villa with a great view and the pool and view are stunning. Monkeys swing in the trees in the jungle outside and the sounds and stars at night are magical. Go on the night kayaking tour to see the bioluminescence - magical. We only stayed one night but I would have liked two. 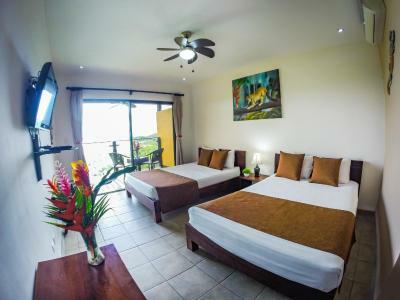 Eco Boutique Hotel Vista Las Islas Reserva Natural This rating is a reflection of how the property compares to the industry standard when it comes to price, facilities and services available. It's based on a self-evaluation by the property. Use this rating to help choose your stay! 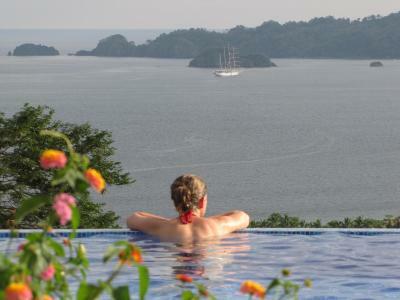 One of our top picks in Paquera.Located on Costa Rica’s Nicoya South Peninsula, Eco Boutique Hotel Vista Las Islas Reserva Natural features an infinity pool, private beach access and spacious accommodations with a balcony. 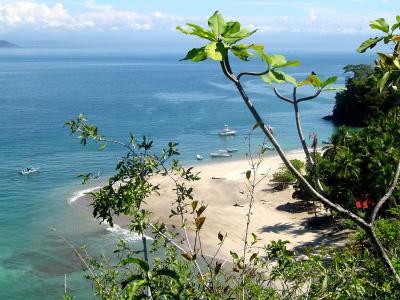 Puntarenas Ferry Port is 5 minutes’ drive away. 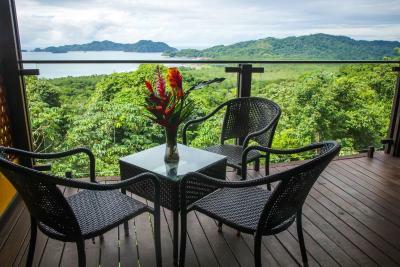 All elegant bungalows have a ceiling fan and a furnished balcony with views over the Gulf of Nicoya or the surrounding mountains. 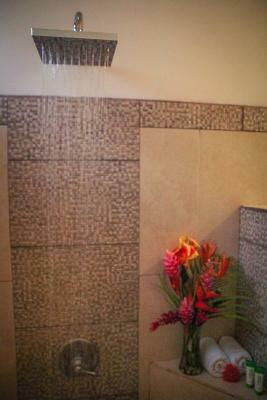 There is a rain shower in the bathroom. 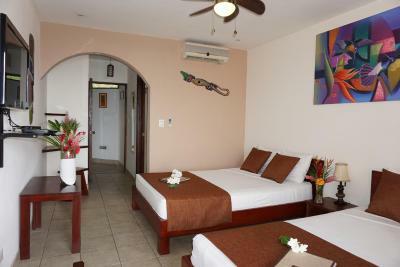 All rooms offer wheelchair access. 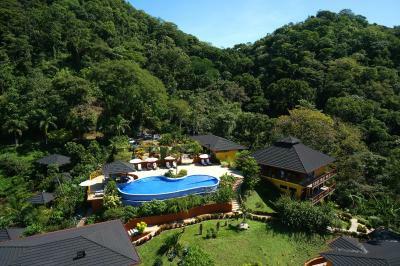 The hotel restaurant serves both characteristic Costa Rican dishes, including Gallo Pinto and Ceviche, and international food. 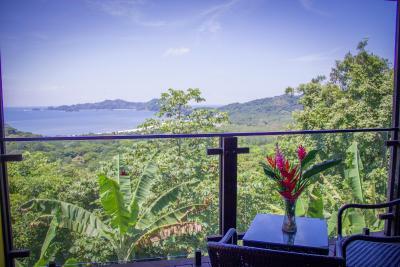 Guests can enjoy views of the sea or the tropical forest from the restaurant. 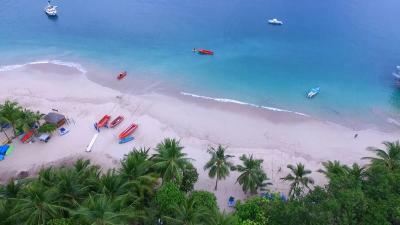 Staff can provide more information on the wide range of outdoor activities available in the surrounding area, including canoeing, snorkeling or hiking. 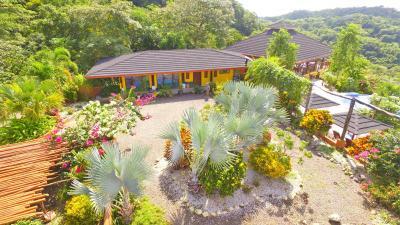 This property also has one of the top-rated locations in Paquera! Guests are happier about it compared to other properties in the area. 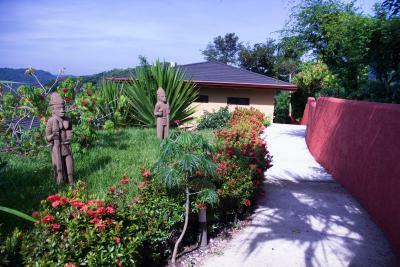 This property is also rated for the best value in Paquera! Guests are getting more for their money when compared to other properties in this city. 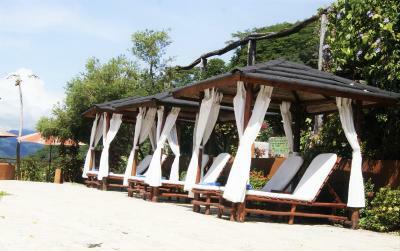 When would you like to stay at Eco Boutique Hotel Vista Las Islas Reserva Natural? 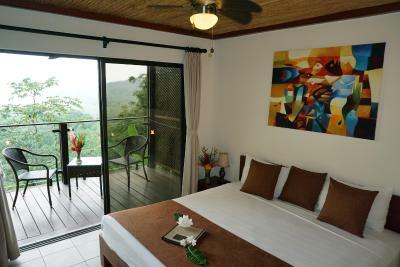 This elegant bungalow features 1 king-size bed and a furnished balcony with views over the bay or the mountains. 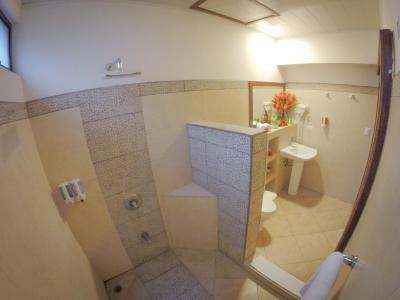 The private bathroom has a rain shower and includes toiletries. The maximum occupancy for this room is 2 people. 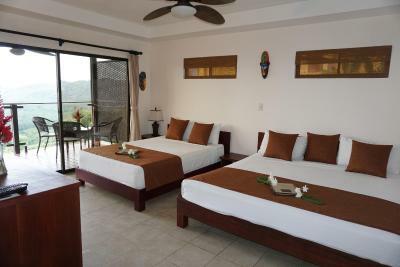 This elegant bungalow with 1 king-size bed or 2 double beds has a furnished balcony with views over the bay or the mountains. 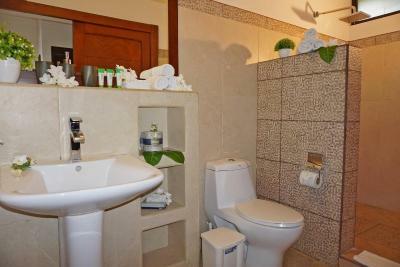 The private bathroom has a rain shower and includes toiletries. 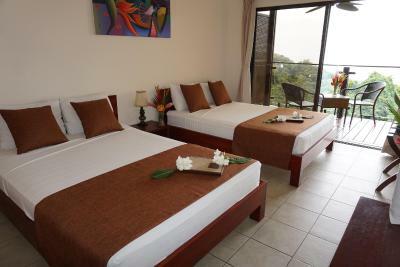 This triple room features a balcony, air conditioning and view. 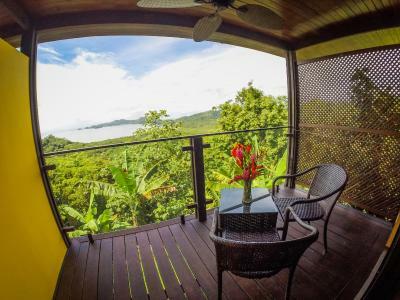 This quadruple room has a balcony, air conditioning and view. 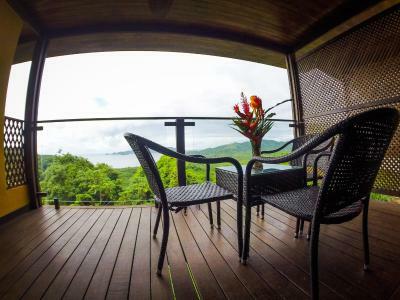 This triple room has a balcony, air conditioning and view. 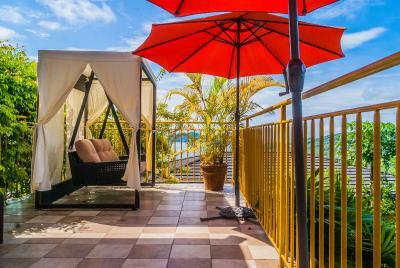 This quadruple room features a balcony, view and air conditioning. 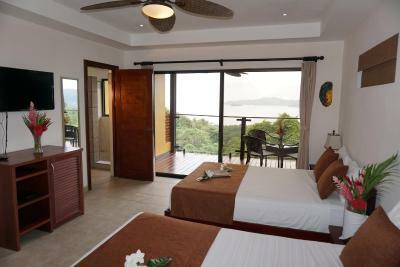 This double room has a balcony, air conditioning and view. 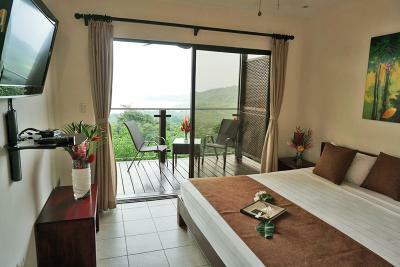 This double room features a balcony, air conditioning and view. 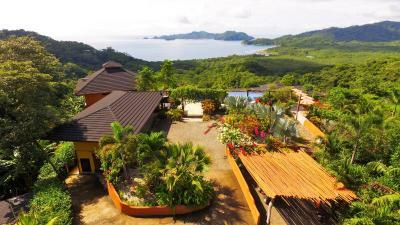 Vista Las Islas Eco Hotel & Reserva Natural is a hotel with special outstanding style, comfort and services. The property lies along the country’s beautiful coastline of the Southern Nicoya Peninsula, and imposes with breathtaking views of the surrounding islands. 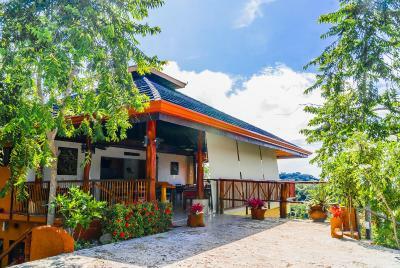 Enjoy the hotel’s own tropical garden, take a swim in the gorgeous infinity pool or relax in a hammock in one of our cozy wooden ranchos while reading a thrilling book. 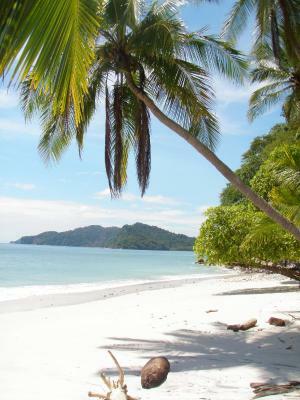 Imagine a tropical getaway that offers sublime luxury in a spectacular exotic environment. Besides adventurous ATV tours, snorkeling or kayaking trips, we offer a lot more exciting tours for every age and interest. 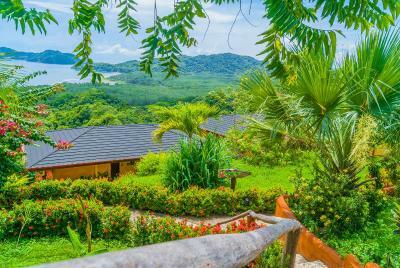 The Eco Boutique Hotel Vista Las Islas is an eco-friendly hotel offering an oasis of green inspired hospitality for families and pleasure travelers in Costa Rica. 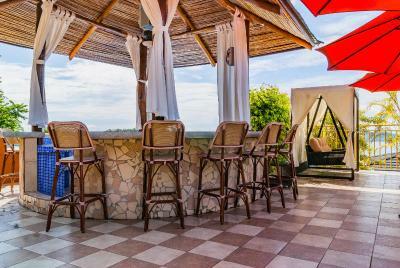 House Rules Eco Boutique Hotel Vista Las Islas Reserva Natural takes special requests – add in the next step! Up to two children under 12 years are charged USD 10 per night when using existing beds. 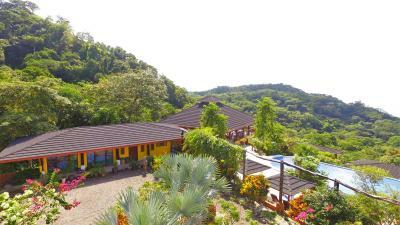 Other Eco Boutique Hotel Vista Las Islas Reserva Natural accepts these cards and reserves the right to temporarily hold an amount prior to arrival. 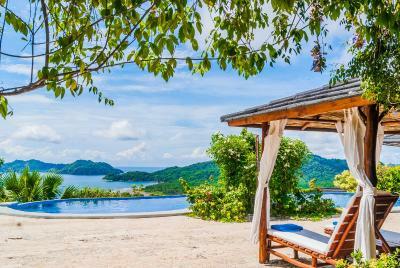 Eco Boutique Hotel Vista Las Islas Reserva Natural accepts these cards and reserves the right to temporarily hold an amount prior to arrival. Please note that the breakfast included is served at the restaurant 150 feet away. There was not enough breakfast for everyone. Every morning they put fresh flowers in your room. This is how much attention they pay to everything. The view is gorgeous, the pool is perfect, the rooms are clean, comfy and huge. Anja at the front desk is awesome, I can't wait to get back to this hotel. 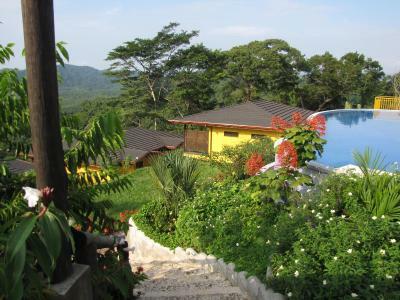 Costa Rica hotels often are different from US hotels. There were just some quirky things, but overall it was great. 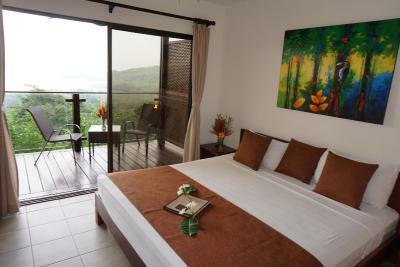 Beautiful view with comfortable, clean room. Staff was friendly. Hotel was quiet and relaxing. Food was delicious. Sounds of the beach and animals. Would stay here again in a heartbeat. 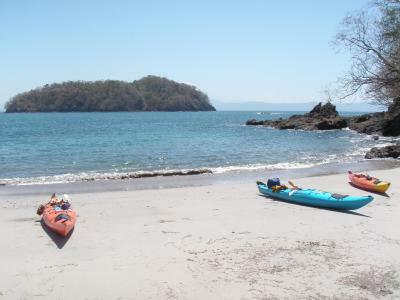 Close to bahia Rica lodge with snorkeling, paddle boarding and bioluminescent kayaking. Perfect little get away. Wow!! From start to finish, this was an incredible place to stay. My partner and I were greeted upon arrival with huge smiles and laughter and friendliness, and even more lovely than the views and staff was the fact they gave us free cocktails to celebrate my partner’s birthday! ;) The happiness at this place was brimming over. We were shown past the amazing - AMAZING - infinity pool to our room, which was spectacular. 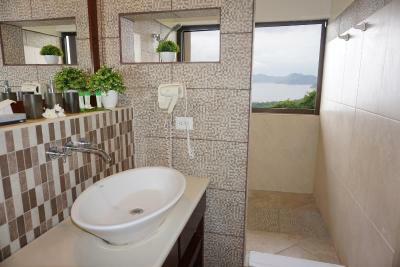 A balcony overlooking the bay, with a shower room also with a huge window over the same view so it felt you were almost outdoors. Breakfast was included and was delicious, and you dine among the birds who come right up to you! To top off the experience, my boyfriend proposed on the balcony of number 10. An amazing stay and we look forward to returning in the coming years! Thank you to all the staff who made our stay extra special. The breakfast is limited in variety and not homemade. It’s abit off the beaten track not walking distance to town 20 walk to a beach. It’s best to have a vehicle. Taxis add up.